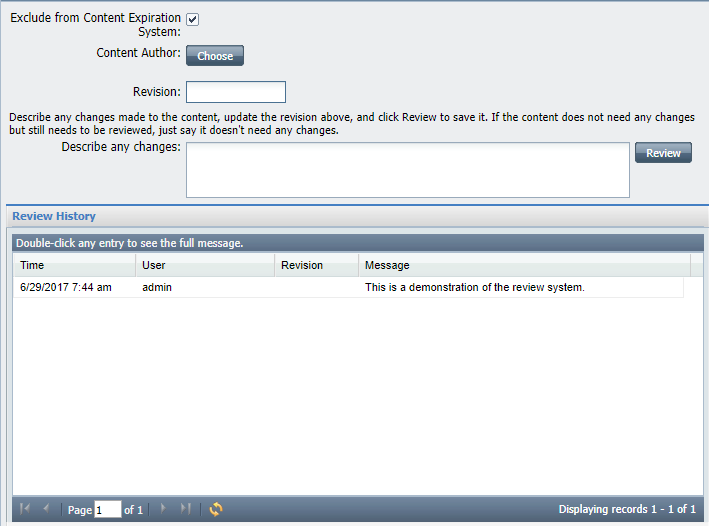 The Content Review/Expiration System was designed to set a review period for a piece of content. The system will email the uploader (Owner) and Author (selected by the uploader), at the end of a specified time period, that the content is getting ready to expire and needs to be reviewed. General Settings is reorganized to accommodate the new system. You will now see a Content tab, where all things related to content are located (including the Expiration System). Once you click the Content tab, the Expiration System is by default deselected. Once you click the Expiration System on, you will see all its options. Content Types — Choose the Content Types that are included in the Expiration System. Require a Content Author — This requires a user to select a Content Author when adding a new piece of content or editing a current piece of content. A Content Author can be any user in the system (Student, Instructor, UGA, Sub Admin, Main Admin), but is typically a Subject Matter Expert (SME) for the piece of content. Content Expiration Time — Set the interval at which a piece of content expires (set in the number of days). In the above example, all content will expire every three days and will need to be reviewed to restart the clock for the expiration period. List of days before expiration to notify owner and author — This is the number of days prior to the day the content is set to expire (resulting in an email being sent). In the above example, an email will be sent two days before the content expires and again one day before the content expires. Set expiration on/off for all existing content — By default, when the system is turned on the content expiration system is turned on for all content. You can toggle this on/off with these buttons. A new Review tab has been added. When adding or editing a piece of content, this is where you add an author, add a revision number and provide notes for the review to reset the count to start the expiration process over for a piece of content. Exclude from Content Review/Expiration System — This will allow you to exclude a specific piece of content from expiring and emailing the owner and author. Content Author — This allows you to choose a Content Author for a piece of content. If the General Settings option Require a Content Author is selected, an Author must be selected before adding a new piece of content or saving a piece of content after editing it. Revision – This allows you to set revision numbers to track reviews and changes. Describe any changes — This allows you to review a piece of content and notate changes that were made. This also resets the expiration period for a piece of content to have it start over. Review History — This catalogs the history of reviews for a single piece of content. Double-clicking the message will display a pop-up so the whole message can be viewed.